Oats, oat bran and oatmeal have the highest soluble fibre content, the kind of fibre that makes your heart healthy, of any other cereal grain. Soluble fibre dissolves in water and becomes a thick viscous gel that slowly travels through the intestine. This thick goo slows down the absorption of glucose which helps to stabilize blood sugars, a definite bonus for people living with diabetes. Beta-glucans, a soluble fibre compound, are responsible for all the pluses in oats. Your liver is on a mission to find cholesterol. It is believed that beta-glucans prevents the re-absorption of bile which forces your liver to get it’s cholesterol from your blood. The beta-glucans in your blood in turn sops up the bad LDL cholesterol. I like to envision it as a drain cleaner commercial – the foamy soluble fibre cleaners unplugging your arteries as they go. The oat fibre may also bind to any cholesterol in your intestine soaking it up and escorting it out of your body. You need at least 3 grams of soluble fibre from oat products on a daily basis to achieve a notable decrease in cholesterol levels. There are Instant, Quick-Cooking and Rolled Oats. The Rolled Oats are sometimes called Old Fashioned Oats or Large Flake Oats. If that isn’t confusing enough, there are also different varieties such as Scotch, Irish Oats or Steel Cut Oats that you will come across in the same aisle. And then there is oat bran. Read your labels and don’t grab the first package you see. Steel Cut Oats are the whole grain oat that has been cut with steel cutters. But just to keep you on your toes they are sometimes called Scotch or Irish oats. Used mostly for hot cereal this cooked oat dish is chewy and has a nuttier flavour than rolled oats. 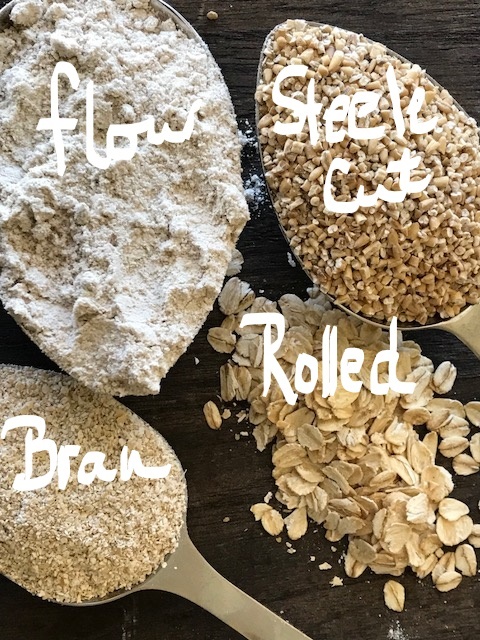 Rolled Oats is that same uncut whole grain oat that has been steamed and then rolled. They come in different sizes, instant, quick-cooking, and large flake sometimes called old fashioned rolled oats. They can be used in hot cereal, in cookie recipes, or in a topping for a crisp. Oat bran is the outer husk of the whole oat grain and contains most of the fibre and some of the fat. Keep it in a cool dry place. I store mine in the fridge or freezer. Look for plain oat bran. In Canada, Rogers and Quaker both sell plain oat bran. Can’t find these brands? Read the label to be sure that the list of ingredients only says oat bran. Oat flour is made by grinding oat oats into a fine powder. I use it when I’m gluten free baking. Because it doesn’t have gluten in it I mostly use it in cookies and crisps. Make sure the oat flour is marked gluten free on the label. Although oats are gluten free, depending on the facility it was processed in, they may or may not have come in contact with gluten. I buy Only Oats at my local Bulk Store.